Paths have been pervasive in human civilization. We are all familiar with the streets, trails, and lanes along which we routinely travel. Ancient Roman roads are utilized in some places even today. In contemporary computer culture we follow “paths” on webpages as we find our way to the information or experience we are searching for or find unexpectedly. There are simulated paths in complex first-person virtual reality video environments, where role-playing games formulate their content around the path to be conquered. 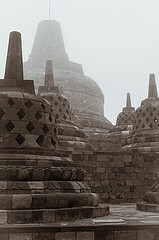 The idea of path is an important concept in Buddhism, and is essential in understanding the meaning and purpose of one of the most remarkable and impressive monuments in the world: Borobudur. Located on the island of Java in Indonesia, the rulers of the Śailendra Dynasty built the Temple of Borobudur around 800 C.E. as a monument to the Buddha (exact dates vary among scholars). 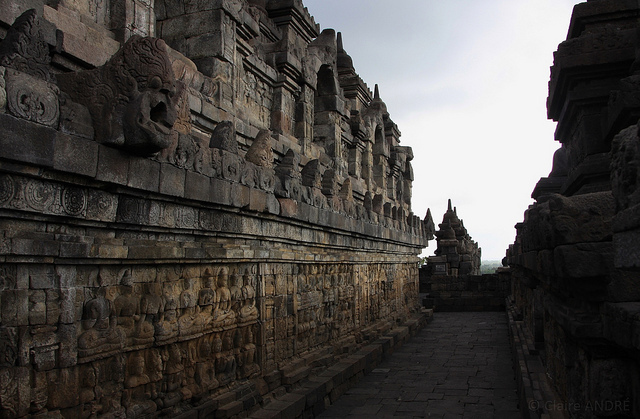 The temple (or candi in Javanese, pronounced “chandi”) fell into disuse roughly one hundred years after its completion when, for still unknown reasons, the rulers of Java relocated the governing center to another part of the island. The British Lieutenant Governor on Java, Sir Thomas Stamford Raffles, only rediscovered the site in 1814 upon hearing reports from islanders of an incredible sanctuary deep within the island’s interior. 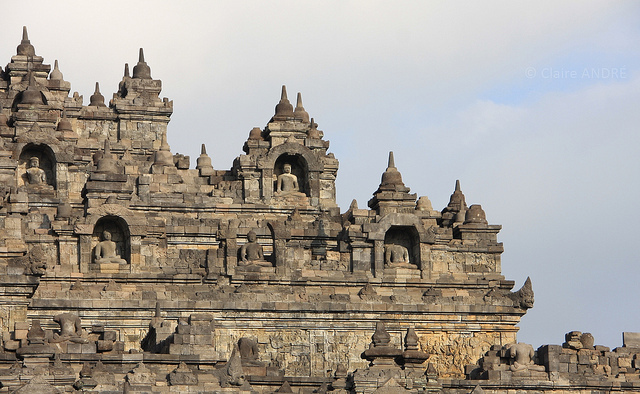 Candi Borobudur’s design was conceived of by the poet, thinker, and architect Gunadharma, considered by many today to be a man of great vision and devotion. The temple has been described in a number of ways. Its basic structure resembles that of a pyramid, yet it has been also referred to as a caitya (shrine), a stupa (reliquary), and a sacred mountain. In fact, the name Śailendra literally means “Lord of the Mountain.” While the temple exhibits characteristics of all these architectural configurations, its overall plan is that of a three-dimensional mandala—a diagram of the cosmos used for meditation—and it is in that sense where the richest understanding of the monument occurs. Set high upon a hill vertically enhanced by its builders to achieve a greater elevation, Borobudur consists of a series of open-air passageways that radiate around a central axis mundi (cosmic axis). Devotees circumambulate clockwise along walkways that gradually ascend to its uppermost level. 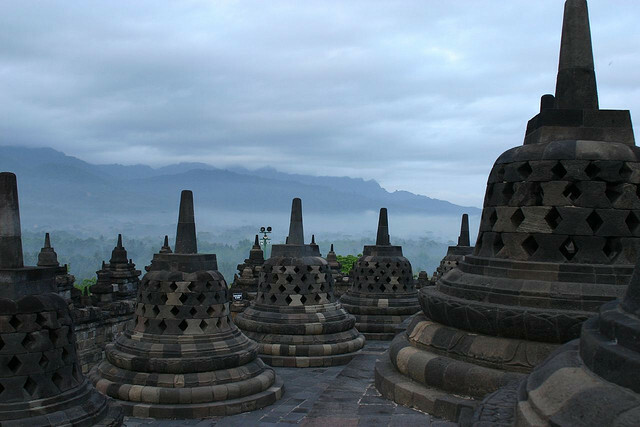 At Borobudur, geometry, geomancy, and theology all instruct adherents toward the ultimate goal of enlightenment. Meticulously carved relief sculptures mediate a physical and spiritual journey that guides pilgrims progressively toward higher states of consciousness. The entire site contains 504 statues of the Buddha. 1460 stone reliefs on the walls and opposite balustrades decorate the first four galleries, with an additional 1212 decorative reliefs augmenting the path. 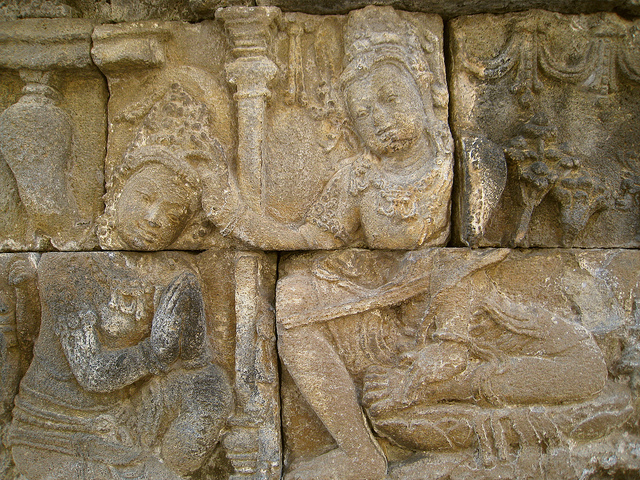 The relief sculptures narrate the Buddha’s teachings (the Dharma), depict various events related to his past lives (Jataka tales), and illustrate didactic stories taken from important Buddhist scriptures (sutras). Interestingly, another 160 relief sculptures adorn the base of the monument, but are concealed behind stone buttresses that were added shortly after the building’s construction in order to further support the structure’s weight. The hidden narrative reliefs were photographed when they were discovered in the late 19th century before the stones were put back to help ensure the temple’s stability. While the sheer size and scope of a mandala structure such as this makes the site worthy of admiration, it is important to understand how the experience of Borobudur relates to the philosophic and spiritual underpinnings of the Buddhist religion it reifies and commemorates. Since its inception, roughly 2500 years ago, Buddhism has directly engaged what it sees as the paradoxical nature of human existence. The most essential tenet the religion promulgates is the impermanent, transient nature of existence. Transcendental wisdom via the Dharma (the Noble Eight-Fold Path) hinges on recognizing that attachment to the idea of a fixed, immutable “self” is a delusion. Enlightenment entails embracing the concept of “no-self” (anattā), understood to be at the heart of eliminating the suffering and dissatisfaction (dukkha) of sentient beings. This is the ultimate message expressed in the sacred scriptures that are solidified in artistic magnificence along the stone walls and railings of Borobudur. The physical movement of circumambulating the structure symbolizes the non-physical—or spiritual—path of enlightenment. 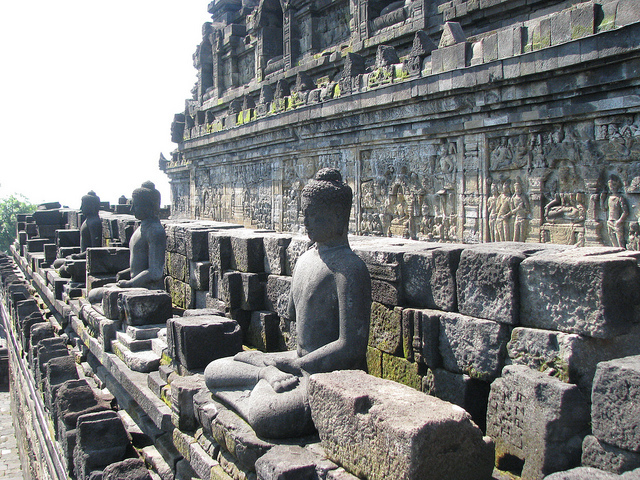 In a real sense, then, the concept of path within Borobudur monumentalizes the impermanent. Like a river that is never the same from moment to moment, to physically move along the path while meditating on the spiritual message of the sutras is meant to help one fully embrace the Buddha’s paradoxical message of impermanence. “I will lead those who have lost their way to the right road. I will be a bright light for those in the dark night, and cause the poor and destitute to uncover hidden treasures. The Bodhisattva impartially benefits all living beings in this manner. I vow to shut the door to evil destinies and open the right paths of humans, gods and that of Nirvana. Once any sentient beings see the Buddha, it will cause them to clear away habitual obstructions. And forever abandon devilish actions: This is the path traveled by Illumination. Sentient Beings are blinded by ignorance, always confused; the light of Buddha illuminates the path of safety. To rescue them and cause suffering to be removed. 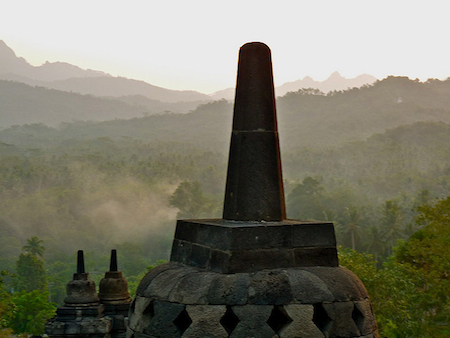 The idea of moving from the darkness into the light is the final element of the experience of Borobudur. The temple’s pathway takes one from the earthly realm of desire (kamadhatu), represented and documented on the hidden narratives of the structure’s earthbound base, through the world of forms (rupadhatu) as expounded on the narratives carved along the four galleries set at right angles, until one finally emerges into the realm of formlessness (arupadhatu) as symbolized and manifested in the open circular terraces crowned with 72 stupas. However, the symbolization of enlightenment these stupas represent is not intended to be merely aesthetic. Buddhist stupas and mandalas are understood as “spiritual technologies” that harness spiritual “energies” in the creation of sacred space. The repetition of form and the circumabulatory progress of the pilgrim mimic, and thereby access, the cosmological as a microcosm. The clockwise movement around the cosmic center reproduces the macrocosmic path of the sun. Thus, when one emerges from the dark galleries representing the realms of desire and form into the light of the “formless” circular open air upper walkways, the material effect of light on one’s physical form merges concomitantly with the spiritual enlightenment generated by the metaphysical journey of the sacred path. Light, in all its paradoxes, is the ultimate goal. The crowning stupa of this sacred mountain is dedicated to the “Great Sun Buddha” Vairocana. The temple sits in cosmic proximity to the nearby volcano Mt. Merapi. During certain times of the year the path of the rising sun in the East seems to emerge out of the mountain to strike the temple’s peak in radiant synergy. Light illuminates the stone in a way that is intended to be more than beautiful. 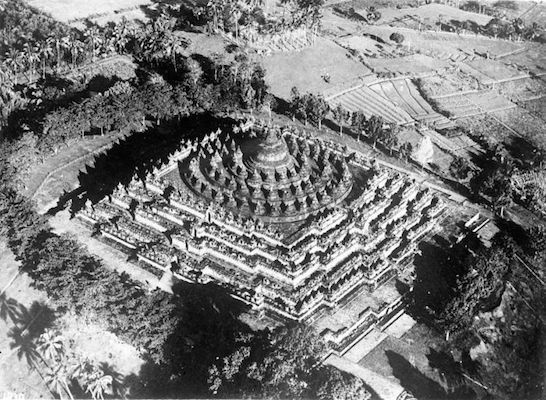 The brilliance of the site can be found in how the Borobudur mandala blends the metaphysical and physical, the symbolic and the material, the cosmological and the earthly within the structure of its physical setting and the framework of spiritual paradox. Cite this page as: Robert E. Gordon, "Borobudur," in Smarthistory, August 9, 2015, accessed April 21, 2019, https://smarthistory.org/borobudur/.